In conjunction with the exhibition Guernica, avec 60 études, Willem Sandberg, director of the Stedelijk Museum, Amsterdam, asks Josep Lluís Sert, the architect who, with Luis Lacasa, designed the Spanish Pavilion at the Paris International Exhibition of 1937, for any material that can be conserved (plans, photographs, etc.) in order to recreate the building. 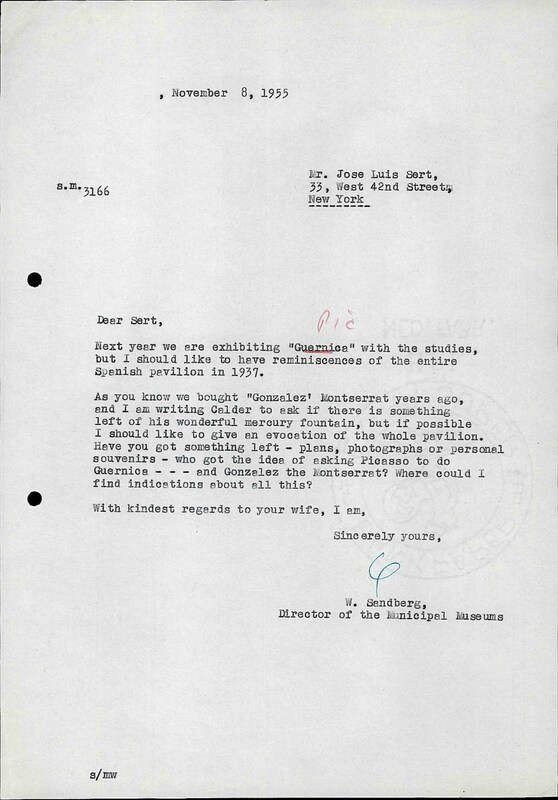 Given that the collection of the Dutch museum includes Julio González’s sculpture Montserrat, Sandberg asks for information on Alexander Calder’s Mercury Fountain and writes of his intention to request the loan of Guernica from Picasso.